It is my distinct pleasure to attend the 71st session of the UN General Assembly. 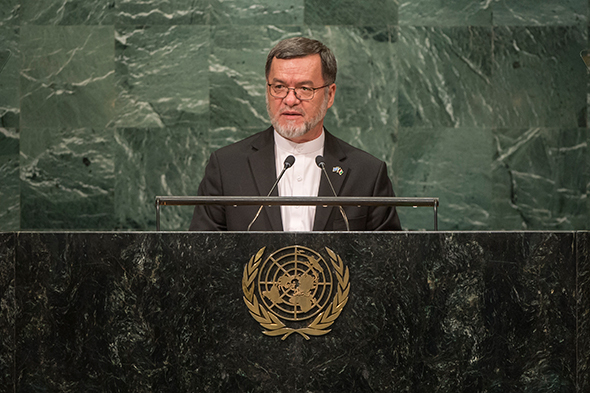 I would like to sincerely congratulate Ambassador Peter Thompson from the Republic of Fiji on assuming the Presidency of this year’s General Assembly Session, and want to thank His Excellency Ban Ki-moon, the UN Secretary General, for a decade of his persistent efforts and wise leadership in support of fundamental freedoms, the rule of law, and justice for all. We wish him every success in his future endeavors. The 21st century has brought with it an ever-complex international arena, where some old conflicts have lingered and exacerbated, while new threats and challenges in the forms of violent extremism and terrorism, displacement and migration, climate change, and other challenges have emerged, threatening all humanity. We have realized that dialogue and cooperation provides the most viable avenue to promote peace and security, and to ensure a world without hatred and conflict. We believe that the UN still remains the single most important international body for the promotion of global peace, security and prosperity, and that achieving a stronger organization remains a priority for all of us in the way forward. The United Nations’ vital role in helping Afghanistan transition into a democratic and pluralistic society is a clear example of its profound impact in helping to create real change for the betterment of societies and communities around the world. Allow me to update the Assembly on the current state of affairs in my country. While the Government of National Unity in Afghanistan has passed two years since its establishment, I would like to briefly present an overview of the achievements of the Government of National Unity under the leadership of His Excellency, Dr. Mohammad Ashraf Ghani, the elected President of the Islamic Republic of Afghanistan. We in Afghanistan aim to strengthen the spirit of national participation and cooperation for reflection and implementation of wishes and will of Afghan citizens. Based on national consensus, all groups, political figures and Afghan elites inside and outside the Government are jointly sharing ideas for strengthening the political system and the Government of National Unity, and for the implementation of reforms within the framework of national interests. The Afghan nation has inherited a legacy of conflict, oppression, discrimination and inequality. We believe democracy is the best solution to these problems, as it provides the only foundation to ensure justice and equality and enable social and political groups to be adequately represented. To this end, we have a modern Constitution that provides for this goal, and only its full implementation can ensure political stability in our society. Our Government has made considerable achievements in different areas over the past two years, including reducing maternal and child mortality, increasing access to education, improving basic freedoms, strengthening the telecommunication and information sectors, improving the rule of law and preserving justice and human rights. Internationally, our Government has gained a proper status, proving to be a trustworthy partner to the many countries that are engaged in Afghanistan and have invested for security and stability of the country. We are sparing no effort to implement our commitments towards reforms. Our well-planned and systematic efforts are ongoing to eliminate corruption, strengthen good governance, conduct judicial reforms, promote women’s empowerment, ensure effective service delivery for our citizens, ensure accountability standards at all levels of the Government, institutionalize merit-based appointments of senior officials, as well as to secure transparency in Government contracts, with the establishment of the National Procurement Commission. In order to strengthen transparency of our future parliamentary, presidential and district councils elections, the process of consultations and technical and legal studies on reforming the electoral bodies and the electoral laws has concluded and initial steps towards electoral reforms will begin very soon. Combating the threat of narcotics is another priority of the National Unity Government. In this regard, we are cooperating closely with UNODC and other international partners, and will continue our joint efforts within the National Action Plan framework. At the Warsaw NATO Summit last July, NATO members and our other allies pledged to provide one billion US dollars in support, on an annual basis, for the Afghan National Defense and Security Forces until the end of 2020. The Resolute Support Mission, which offers support in areas of training, advisory and assistance to the Afghan security forces was also extended beyond 2016. We extend a particular debt of gratitude to the United States of America for providing the largest share of support. In less than two weeks time, Afghanistan and our international partners will come together at the Brussels Conference to review and reach important decisions on the full scope of the joint partnership in the way forward. The National Unity Government will be presenting a comprehensive update on the positive trajectory of our reform efforts, conducted on the basis of the Self-Reliance Through Mutual Accountability Framework (SMAF). We look forward to our international partners to make new pledges of assistance on the basis of Afghanistan’s National Peace and Development Framework (ANPDF). Despite these achievements, continuation of the undeclared war against Afghanistan and the need for security still remains a serious challenge for the Government of National Unity, as our people are still subject to merciless attacks of terrorist groups. Currently, more than ten terrorist groups who are sent from outside Afghanistan with the goal of creating obstacles for our state-building efforts and preventing the establishment of peace and stability are fighting against us in Afghanistan. One of their main objectives is to suppress democracy, freedom of speech, and our free and independent media. That is why our journalists are subject to serious threats while reporting from the battlefields, and also during terrorist attacks. Afghanistan requests the United Nations to appoint a Special Representative for the Safety of Journalists, focused on the protecting all journalists, including those serving in Afghanistan. Over the past several months, terrorists including Taliban and Daesh (ISIS), who continue to enjoy foreign support, attacked a peaceful and civil demonstration of the Enlightenment Movement in Dehmazang Square in Kabul, and killed tens of our educated youth and elite. They also attacked the American University of Afghanistan and other civilian facilities, killing hundreds of innocent civilians. Based on existing evidence, these attacks were planned and organized from the other side of the Durand Line, inside Pakistani territory. This year, the Taliban tried to take control of more areas in the country, especially in Kunduz and Helmand provinces, but were confronted by our national defense and security forces. As a result, hundreds of extremist militants of the Taliban and Daesh, many of whom were foreign fighters were killed or captured. We call on the international community to pay particular attention to the elimination of terrorist safe havens, located outside of the country. We urge States to honestly implement their international pledges in the fight against terrorism and to avoid a dual policy of making a distinction between good and bad terrorists, which undermines the international order. We ask all of you: Where were the previous leaders of the Taliban and Al-Qaeda residing, and where were they killed? At this very moment, where are the leaders of the Taliban and Haqqani network located? From where and how are terrorists being trained, equipped and financed during a full-scale war? We have repeatedly asked our neighboring country Pakistan to destroy the known terrorist safe havens, but we unfortunately are yet to witness any change in the situation. Afghanistan has always desired peaceful relations with all countries in the region. However, the Government of National Unity reserves the right to do whatever is necessary for the defense and protection of our people. We have also kept open the doors of peace and negotiations for those Taliban elements and other armed opposition groups who are willing to give up violence, return to peaceful life and adhere to our Constitution. In this connection, a peace agreement is about to be signed between our government and Hizb-e-Islami Party. This will be an important step for progress in our peace process. Despite our security challenges, Afghanistan has always maintained a positive approach in regards to our relations with all regional countries and the Islamic world. We consider Islamic countries to be our best partners, and seek to strengthen our cultural, social, and economic ties and to use our experience to promote peace and coexistence and present a moderate interpretation of Islam. In this regard, we welcome the expressed readiness of the Organization of the Islamic Cooperation (OIC) and any Islamic country to help promote the peace agenda in Afghanistan. I want to add that Islam, as a religion has a clear thought, culture, civilization and history that on the one hand respects human dignity, rights and freedoms and drives national sovereignty from the will of people, and on the other hand, is against any kind of injustice, exclusivism, hatred, radicalism and violence. Those individual and groups that resort to violence, terror, and killing under any name are not acquainted with the spirit of this humane religion, and in fact are using Islam only as a tool to achieve their evil goals. How can Islam possibly give permission for terrorism and suicide attacks to take the lives of thousands of innocent people, when it clearly considers human as the representative of God on earth, assigns him dignity and gives him heavenly deposits in the holy verses of Quran and also considers killing of one innocent human equal that of killing all of humanity? We expect of the prominent Islamic Scholars who will soon take part in an important Conference in the Holy city of Mecca to further enlighten the true image of Islam, and declare their condemnation of terrorists and extremists, on behalf of our great religion. In order to achieve regional cooperation, we need to have a stable region. Afghanistan’s foreign policy is founded on the creation of an “economy based secure society.” Afghanistan is an active member of the regional organizations of SAARC and ECO, and an observer member of the Shanghai Organization and aims to actively take part in the revitalization of the regional cooperation agenda within the Heart of Asia Istanbul and RECCA processes. Afghanistan and all of the regional countries have common threats and interests. We should come together and cooperate to fight against our common threats including terrorism, radicalism, drugs, organized crimes, illegal immigration, and smuggling. Also, the establishment of the regional railroad, energy transit, mine extraction, trade and transit can provide an important joint economic cooperation for us. 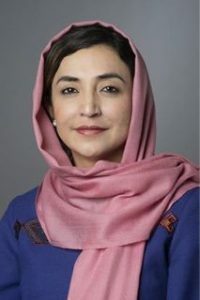 Afghanistan, as the important crossroad of trade, transit, and economic activities can connect South Asia to Central Asia and Middle East to East and South Asia. Afghanistan has already made significant progress through projects such as TAPI, CASA-1000, Lapis Highway, the railway corridor between China, Iran and Afghanistan, and expansion of cooperation in Chabahar port of Iran. With implementation of these projects, Afghanistan can reach international markets, and the regional countries can also get better connected. With respect to the principles of non-interference in the affairs of other countries, avoiding use of force in resolution of conflicts, respect for territorial integrity and national sovereignty, exchange of knowledge, science and technology, and most important of all, through promotion of peace and lasting security and stability, we can prepare for economic growth of all countries of our region. Therefore, we request all our neighboring countries to cooperate with us in provision of security and stability in the region, which is a pre-condition for achieving economic interests and welfare. The countries of the region should recognize that without the provision of security and stability in Afghanistan, none of us will achieve lasting stability and economic welfare. In November 1946, Afghanistan was the first country to become a UN member state after the 51 founding countries of the UN, and since then seriously adhered to its international commitments. Over the last sixteen years, we have served as a point of convergence whereby the international community has come together. 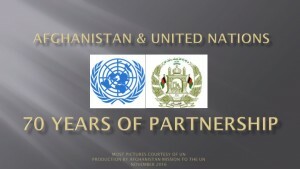 In this connection and on behalf of the Afghan nation, I wish to also highlight and thank the centrality of the UN’s role in facilitating an effective international support role for Afghanistan’s stability and prosperity. During recent years, we have signed documents of long-term strategic cooperation with 20 of our allies, including the US, EU and NATO, and in important conferences of Bonn, Tokyo, London, Chicago, and Warsaw they have announced their valuable support for the Afghan Government’s policies and decisions. Afghanistan, like other members of the international community, is serious and decisive in fighting radicalism and violence, and will continue its strong fight against this ominous phenomenon. It has been years that our nation is at the forefront of the fight against terrorism and has made tremendous sacrifices in order to defend common values of humanity. We have lost many of our great national figures such as: Martyr Ahmad Shah Massoud, Martyr Ustad Burhanudding Rabbani, Martyr Ustad Abdulali Mazari, Martyr Abdulhaq, Martyr Haji Qadir, and hundreds of Ulemas, MPs, Officers, and members of our political elite. However, we believe that terrorism and radicalism have become global threats against world peace. This is true when we witness signs of radicalism in different forms in Europe and America, and incidents of terrorist attacks in many countries of the world. In this regard, and considering the extent of these threats, measures of the international community in the fight against terrorism and radicalism will never be enough and successful unless effective holistic measures encompassing political, cultural, economic and even military aspects are considered as a universal strategic needs. The UN should hold an international conference on the fight against radicalism with the aim of introducing a new legal set up to combat terrorism. We believe that serious efforts in the fight against terrorism and radicalism are in need of exact and thorough planning for at least 20 years, and in this plan, Afghanistan should receive special attention from the international community as we are at the forefront of this fight. One of the ominous outcomes of violence and radicalism is the new wave of immigration in the last year that has made it an important international challenge. We express gratitude to the countries that offer support to Afghan immigrants, especially Germany and other European countries that welcome Afghan refugees with open arms and with human-loving spirit. We also request the UN and its member states to have a new approach towards this international challenge and help the countries where immigrants are coming from to deal with the roots, causes and reasons of immigration, especially the ominous phenomena of war, poverty, and illiteracy. A glimpse to the world conditions shows that injustices, threats of violence, and conflicts are still endangering millions of human lives throughout the world. We are witnessing the extent of devastation and terror in Syria. We announce our full support to a comprehensive solution to the Syrian conflict that will reflect the will of all Syrians. We also wish for a comprehensive and peaceful solution to the conflict in Yemen. We support the new international efforts to resolve the issue of Palestine and to provide the legitimate rights of brave and noble Palestinians including the right to have an independent government and invite all sides to start direct talks in order to achieve a sustainable solution based on the principle of peace and peaceful coexistence. 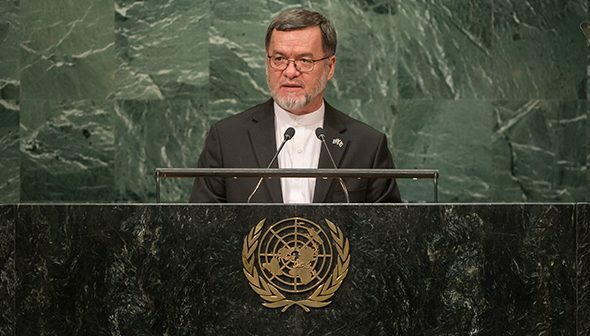 Afghanistan supports the historic agreement between 5+1 countries and the Islamic Republic of Iran on the Iranian nuclear program within the Joint Comprehensive Plan of Action and deems implementation of this agreement as constructive for the provision of peace, stability, and sustainable development of the region and the world. In regards to nuclear programs, I should add that we believe, North Korea’s tests of nuclear weapons are dangerous for the region and can endanger world peace and security. Since 2001, when we commenced a new chapter of our modern history, Afghanistan has regained its historical place among the responsible members of the family of nations represented in this Assembly. Through words and deeds, we have shown our full and abiding commitment to uphold the principles of the UN Charter, and to render our role in promoting global peace, justice, human rights, and the rule of law. It is in this context that we have presented our candidacy to the Human Rights Council for the period 2018-2020. We call respectfully and friendly on all of our friends and all the member states to support our candidacy in the upcoming elections. In conclusion, I wish to reiterate, on behalf of the Afghan people and Government, our deepest gratitude to all of our international partners that have stood beside us in our quest for peace, security, and prosperity over the past sixteen years, and I specially thank the sacrifices of NATO/ISAF troops in the fight against terrorism in Afghanistan. Together, we have come a long way in our journey, but our task is undoubtedly unfinished. We look to your continued support over the coming years, and stand confident in realizing the goals we have jointly set to achieve. Here I wish to highlight once again, Afghanistan’s firm commitment to the realization of a world in which peace, harmony, justice, and tranquility prevails.